If your cabinets are unattractive but otherwise in good condition, you do not need to invest in costly cabinet replacement. Cabinet Magic offers an affordable way to completely transform the look of your kitchen. How do we do it? With cabinet refacing in Tustin CA. What Is Cabinet Refacing in Tustin CA? Cabinet refacing in Tustin CA is a cabinet remodeling service that allows you to replace only what needs replacing for maximum visual impact: your cabinet doors, drawer fronts, and crown moldings. Any other exposed cabinet surfaces, such as the outsides of corner or end cabinets, will also be updated. We typically cover these surfaces with a matching material so they look just like your new doors and drawer fronts. Your new cabinet doors and drawer fronts will be custom made just for you, to suit whatever design constraints you may have. We offer an extensive choice of cabinet styles and colors. When cabinet refacing in Tustin CA is paired with new features like soft close hinges, lazy susans, and pull-out racks for deep cabinets, the result is cabinetry that looks and functions like new. It’s Cost-Effective: Cabinet refacing is simply the most cost-effective way to get the look of brand new cabinetry in your kitchen. 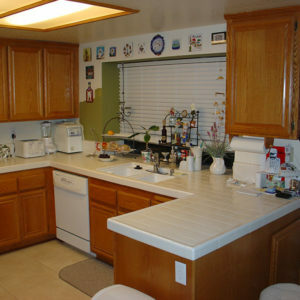 It is certainly much more affordable than getting all new custom cabinets. It’s Convenient: Cabinet refacing is a quick and easy kitchen remodeling service. There’s no need to have the kitchen gutted and then wait for the new cabinets to come in. Instead, we can typically replace all your doors and drawer fronts in just one visit. It’s Eco-Friendly: Throwing out old cabinets and making new ones from scratch has a big environmental impact. Cabinet refacing gives you the same look with a much smaller carbon footprint. Are you ready to make the kitchen of your dreams a reality with cabinet refacing in Tustin CA? Cabinet Magic is here to help. Our top-quality craftsmanship, combined with a dedication to customer service, allows us to consistently meet and exceed client expectations. Take the first step towards your new cabinets today by calling 800-828-4380 and requesting a free in home estimate.